For over five generations, National Geographic magazine has dazzled and educated people with its incredible photographs and gripping stories from all corners of the earth. 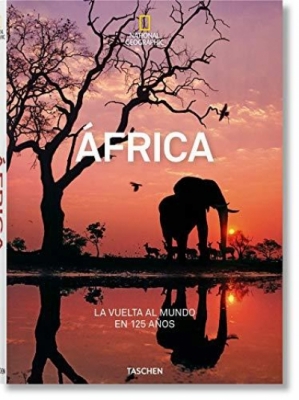 Inspired by our monumental Around the World in 125 Years, this volume curates around 200 captivating images sourced directly from the National Geographic historical archives, including 40 new photographs, that traverse the landscapes, history, cultures, and wildlife of Africa. Our continental journey through amazing Africa ranges from evocative early black-and-white pictures to autochromes, from the golden age of Kodachromes to digital. Along the way, we fly over the misty volcanoes of Uganda in a 1950s plane; follow archaeologists into the cool, musky tombs of Egypt; gaze up at the gleaming skyscrapers of Zimbabwe; admire the ritual masks of the Chokwe tribesmen of Angola; get lost in a labyrinth of alleys and souks in Algeria's old quarters; wonder at the fragile red-tufted flowers of South Africa's Drakensberg mountains; trudge behind Kenyan farmers as they battle clouds of flying locusts; and gingerly spy mountain gorillas enjoying the Rwandan sunshine. Long before the Travel Channel and Google Images, these images celebrated Africa's spectacular landscapes, incredible wildlife, and diversity-but also reflect edgier stories that speak of rural hardship, environmental threats, and the lasting remnants of forced colonization. Leaving no stone unturned, this definitive voyage is in equal parts a breathtaking homage to an incomparable continent, and a unique tribute to the world's most famous photography magazine.